In the return of Open Floor, James Harden reflects on last year, LaMarcus Aldridge comments on free agency and the Hawks adjust without DeMarre Carroll. HOUSTON — Last month, an hour or so after Houston completed a preseason practice, James Harden emerged from the Rockets locker room dressed in sweats and a tee shirt, with one pair of what has become an absurd number of Adidas sneakers on his feet. Oh you didn’t hear? Last August, Harden signed a 13-year, $200 million deal with Adidas. In September, Harden was photographed wearing a pair of Nike’s. In response, Adidas sent Harden a truckload of sneakers. That’s not a cliché. They literally dispatched a truck filled with sneakers to his house. Yeah, it’s good to be James Harden. You were runner-up for MVP and took home the players version of the award last summer. You are coming off your best statistical season (27.4 points/7.0 assists/5.7 rebounds) and are credited for taking defense seriously for the first time. You strapped a battered Rockets team on your back, pulled them out of a 3–1 deficit against the Clippers in the conference semifinals and led Houston to its first conference finals since Hakeem Olajuwon wore a Rockets uniform. Things are good ... right? How do the Rockets get better? Ty Lawson helps. The ex-Nuggets point guard comes with some baggage—a July DUI arrest, which prompted Denver to immediately look to move him—but there is no questioning his talent. With Lawson and Patrick Beverley on board, Houston has a skilled offense/defense point guard combination. How can Harden get better? He has an answer for that too. If there was one criticism of Harden last season it was that he would frequently exhibit bad body language. 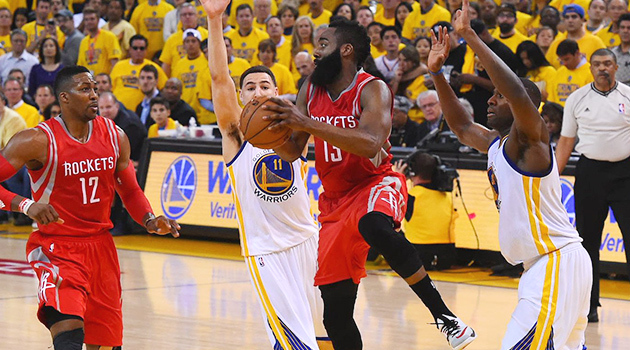 If a teammate took an errant shot, Harden would scowl or slump his shoulders. If he committed a turnover, he did little to hide his frustration. Physically, Harden will admit last season was a grind. He played in 81 games and led the league in total minutes (2,981). With Dwight Howard limited to 41 games and Beverley sidelined for the playoffs, the strain on Harden was considerable. Harden has always been a healthy eater—nutrition habits instilled with him in Oklahoma City stay with him today—but he needed to give his body a break. Which is why Harden decided to get away from the game this off-season. For a month, he didn’t pick up a basketball, the first time he has ever taken that kind of extended break. He traveled. He rested. He got regular massages. He blocked out the game. As Harden begins this season, he is facing an even bigger challenge than the last one. Golden State is still the defending champs. San Antonio got better. Oklahoma City will welcome Kevin Durant back to a deeper team than the one he left before his foot injury. The Clippers are still there. Every night in the Western Conference figures to bring a tough test. Harden gets it. But he knows that his team is as talented as it was last season. He says his relationship with Howard on the court is as strong as it has ever been. And he believes the lessons learned from last season will help him be a better player in this one. A championship is the goal, obviously. Harden has come close before. In 2012, Harden was the sixth man on Oklahoma City’s Finals team. He remembers that loss. That loss hurt. Losing with Houston, Harden says, hurt more. No team was a bigger surprise than Atlanta last year. The Hawks won 60 games and advanced to the conference finals despite having no traditional superstar and being forced to play with the scandal precipitated by former GM Danny Ferry’s racially tinged comments about Luol Deng hanging over their heads. Ferry is gone, which is probably a good thing. He’s a fine GM who was the architect of Atlanta’s retooling from an overpriced, star dependent contender into a more balanced one. But Ferry’s comments, regardless of intent, forever poisoned his relationship with a large chunk of the Atlanta fan base; he had to go, and everyone in the organization knew it. Who Atlanta didn’t want to let go was DeMarre Carroll, the versatile small forward who was a defensive stopper for the Hawks last season. Hawks coach Mike Budenholzer, a Gregg Popovich disciple, likes a few things: He likes ball movement; the Hawks recorded assists on 67.6% of their made baskets, best in the league. He likes defense; Atlanta ranked in the top-five in the NBA in points allowed (97.1). And he likes consistency; the Hawks starting lineup of Carroll, Al Horford, Paul Millsap, Kyle Korver and Jeff Teague was 42–13 last season. Carroll will be difficult to replace. Budenholzer will take a by-committee approach early, giving Kent Bazemore, Thabo Sefolosha (who is still recovering from a leg injury caused by NYPD officers last year) and newcomer Tim Hardaway Jr. opportunities to earn the role. But while the personnel will change, Budenholzer insists the Hawks style of play will not. Budenholzer said he is not expecting one player to replace Carroll, nor does he want any of his potential replacements to try and emulate him, something he has emphasized during camp. Bazemore is an elite athlete who struggled with consistency. Sefolosha is a strong defender, though at 31 he has been on the decline. Hardaway has perhaps the highest ceiling, but he will need to prove he can be a more reliable shooter and a pass-first type of player. Aldridge, whose decision to leave Portland and sign with San Antonio shifted the balance of power in the Western Conference, is the subject of my story in this week’s issue of Sports Illustrated, our NBA Preview issue. Recently, Aldridge sat down with SI and opened up about his decision to leave Portland, his relationship with Damian Lillard and Kobe Bryant’s impact on his free agent meeting with the Lakers. SI.com: In 2014, you said you wanted to re-sign with Portland. When you put off thumb surgery in January, people saw that as a sign of your loyalty to Portland. What changed? LaMarcus Aldridge: You know I think just weighing my options and just going through the process really kind of helped me see what I valued. It wasn’t easy leaving. I love Portland and I have so much history there and I knew it like the back of my hand, so the decision to leave was never easy. When I put off [thumb surgery] I definitely didn’t think I was leaving. I wanted to maximize that moment. I didn’t want to waste that. I wanted to be in the moment, I wanted to help finish the season out well and to play in the playoffs. So in that moment I was in the mind-set that I was coming back. But I think as I went through the process more I just value being closer to home, I value seeing my kids more. I feel like, of course, Portland didn’t want me to leave, but I feel like at the end of the day it’s good to have a fresh start. You know we had first round [exits] for so many years, and then we finally got to the second round, but I think for both sides it’s actually really good. It’s better to get a fresh start and now they have no battle with who’s the face of the team. Damian [Lillard] is a very high talent so he’s going to be good for years to come. So I think in a way it actually made it easier on them too. SI.com: Your relationship with Lillard was believed to be one of the reasons you decided to leave. How would you characterize that relationship? LA: I thought that stuff was blown out of proportion. 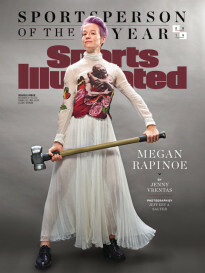 I feel like the organization blew it out of proportion and I felt like the media blew it out of proportion. Of course him and I could’ve talked more and been closer. You know we’re both ... the issue you have when you have two guys that are very similar as far as competitiveness and drive and kind of being brought up the same way is that they’re both the same way so you don’t have one person that really goes out of his way to make a relationship. SI.com: Could Portland have done anything different? LA: No, I think they did everything that they could. I thought they were trying to see what I wanted, what I needed. They were trying to keep me involved every step of the process. I thought that they definitely made me feel like they wanted me back. They were very interested in having me back, they wanted me to still be the focal point of the offense, so I don’t think there was much they could have done. I think it was just that time, where we had tried and tried and tried and I feel like San Antonio, and being home, it was just a lot of positives. Like I said being home was one of my goals and to be there and to just see my family was key. SI.com: There was a lot of talk about the Lakers free agent meeting. It seemed like it went badly. What happened? LA: I’m not going to get into details, but it was just a couple of meetings. The first meeting didn’t go as well as they said and then the second meeting went better. I’ll go on the record as saying Kobe was not an issue at all. He was a very positive part of the meeting. I’ve always had a very cordial relationship with Kobe. I see him all the time in Newport [Beach], and it was really messed up that [the media] put it on him when he was one of the best parts of the meeting. But like I said, the first one didn’t go as well, the second one went a little bit, but at the end of the day going back home was more valuable. SI.com: Hypothetical questions: If Portland didn’t get ravaged by injuries last season and the team went deeper in the playoffs, would you be back? LA: I don’t know. It’s not easy to say or you don’t know how you would exactly feel in that moment so I really can’t say. Maybe I would have, maybe not, but I think we definitely wanted to go further and we thought that team could have if we didn’t get hurt. 1. Cavaliers: You have to be a serious Cleveland cynic not to make the Cavs the frontrunners for the title. This team is stacked. I mean, the comeback of Anderson Varejao, a very good player, is almost an afterthought. 2. Warriors: Giving the defending champs respect here, though the top of the Western Conference is a minefield. Effectively swapping out Jason Thompson for David Lee is an upgrade defensively in a power forward-rich conference. 3. Thunder: Sam Presti did a fantastic job reloading this roster during a snake bitten ’14–15 season. OKC is two deep at every position. 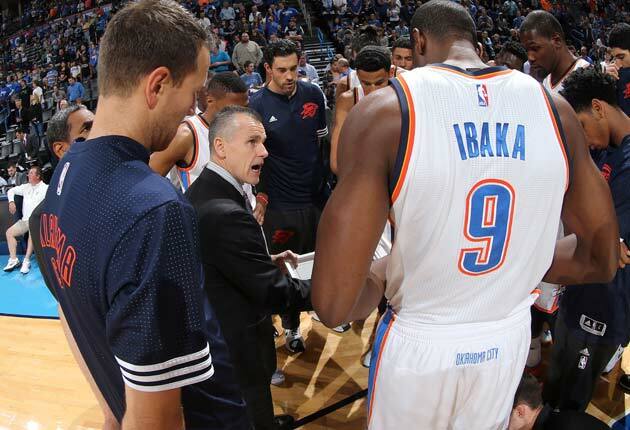 The biggest question: Is Billy Donovan the right guy to coach them? 4. Spurs: Don’t expect the revamped Spurs to charge out the gates like Boston in ’07–08. 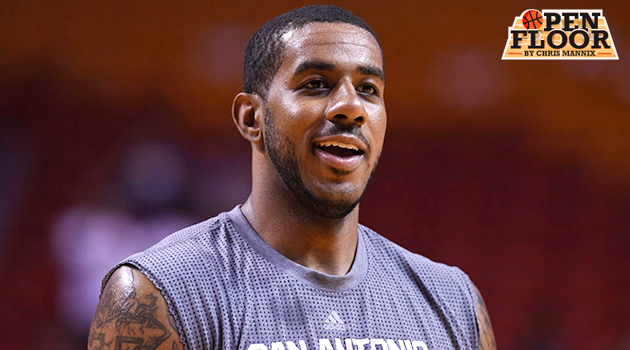 Incorporating LaMarcus Aldridge will take some time. But when he gets acclimated, look out. 5. Rockets: Absolutely love the Ty Lawson addition. Expect Kevin McHale to play Lawson and Patrick Beverley together in two-point guard lineups. That will take even more ball handling pressure off of James Harden and make Houston a lethal transition team. 6. Clippers: The band—plus Paul Pierce—is back together. Will there be any hangover from an ugly postseason exit last spring? Sense of urgency is high in L.A.
7. Pelicans: One scout told me he thinks Alvin Gentry is worth 5–6 wins along for New Orleans this season. Jrue Holiday’s healthy a big key for the Pels. 8. Raptors: In Masai (and Dwane) I trust. 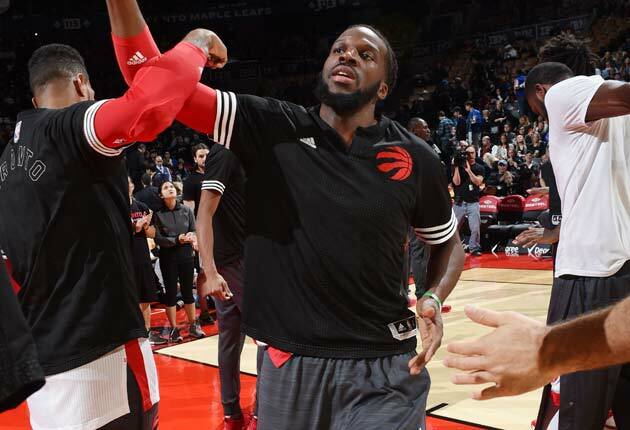 Off-season additions of DeMarre Carroll, Cory Joseph and Bismack Biyombo bolster a defense that stunk up the joint last year. And Kyle Lowry has put up some big numbers this preseason. 9. Grizzlies: Memphis will dominate the paint (again) and has an elite point guard in Mike Conley. Can the Grizzlies get consistency out of Jeff Green and enough shooting from everyone else? 10. Bulls: Let’s think optimistically and say Derrick Rose will be healthy next season. Next question: Can Joakim Noah and Pau Gasol play together? Preseason results have not been encouraging. 11. Hawks: Mike Budenholzer told me he loves what he is expects to get from Tiago Splitter, who will take plenty of physical pressure off of Al Horford. Can they replace DeMarre Carroll? That’s a problem, and it’s a big one. 12. Heat: The Heat have one of the best starting lineups in the NBA. But can their bench provide enough support to keep some of the starters’ banged up bodies healthy in April? 13. Bucks: If Michael Carter-Williams has a strong second season in Milwaukee, the Bucks will jump these rankings quickly. Lots of young talent for Jason Kidd to work with. 14. Wizards: The Wizards say they want to play up-tempo, shoot less midrange jump shots and be more aggressive shooting three’s. Great. Now lets see if they do it. 15. Celtics: Boston has an elite defensive backcourt and a super scorer in Isaiah Thomas coming off the bench. If Brad Stevens can nail down a consistent frontcourt rotation, Boston will improve on last season’s 40-win finish. — Rajon Rondo, via Cowbell Kingdom, on his relationship with George Karl. The comments briefly caused a social media firestorm, until Rondo clarified that he was kidding and Karl professed that his relationship with Rondo could not be better. I believe them. Still, the Kings, with some big personalities on the roster (and in the coach’s box) are a team to watch this season. — Carmelo Anthony, who has called for Knicks coaches to hold him accountable more this season. I like the attitude from Anthony, who has to be feeling his own NBA mortality at this point. But my first thought: It’s pretty bad that the Knicks coaches were not doing that before. • Rondo among players in contract years | Can Melo carry Knicks to playoffs? Good for you, John Henson. Schwanke-Kasten—which made its Instagram and Twitter accounts private on Monday—and its employees should be embarrassed. So, too, should the police officers that treated Henson like a criminal. Storeowner Thomas Dixon offered a weak explanation, telling a local TV station that the store had been robbed three times by someone in a car matching Henson’s. OK. Sure. Whatever. The Whitefish Bay police disputed Hensons’s version of the events, saying the officers merely inquired about Henson’s dealer plates. I have no doubt that once the people involved realized Henson was a millionaire NBA player, it eased the tension. It’s how they treated Henson before they knew that is what is most troubling. In the debut episode of SI.com's new NBA podcast Open Floor, I chat with Thunder head coach Billy Donovan about his transition to the NBA and what it's like coaching Kevin Durant and Russell Westbrook. Later in the program, the Chicago Tribune's K.C. Johnson discusses Derrick Rose, Fred Hoiberg and the Bulls' upcoming season. 14. The Hornets are 6–0 in the preseason and getting production from players not named Al Jefferson. That has to make Steve Clifford very happy. 13. Cleveland’s 0–6. I bet everyone is panicking. 12. Noted this on Twitter, but it’s worth noting again: The exploitation of Lamar Odom by some entertainment media outlets has been despicable. Glad to hear Odom is on the road to recovery. One of the genuine good guys in the NBA who has endured so much. 11. 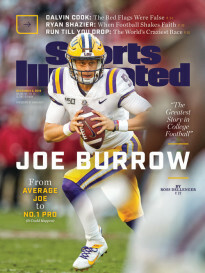 Speaking of Odom, SI.com’s Lee Jenkins has one of the best pieces you will read about him and another in the magazine this week. 10. How disappointed Boston must be in Jared Sullinger. Sullinger openly acknowledged his need to come to camp in better shape at the end of last season. He doesn’t look it, and Brad Stevens isn’t going to give him minutes over David Lee and Amir Johnson just because he’s younger. The time for valuing development over wins in Boston is over. 8. Interested to see how Stan Van Gundy handles his team this season. Van Gundy rode his players hard last season. Long practices. Long shootarounds. Van Gundy was determined to break some bad habits and instill good ones. Will he do it again? Or will SVG loosen the reigns a little bit? 7. I love Scott Skiles coaching a young team in Orlando. 6. Future head coaching candidates to watch: Kenny Atkinson, Adrian Griffin and Darren Erman. Honorable Mention: David Fizdale. 5. Here’s hoping Indiana’s struggles this season—and it will struggle, no matter how many small lineups it puts on the floor—doesn’t cost Frank Vogel his job. The Pacers committed to a quasi-rebuild when they moved away from the Roy Hibbert/David West combination. It’s going to take time to get back. 4. I looked for ways not to pick Portland to finish last in the West. I couldn’t find them. 3. The Matt Barnes-Derek Fisher story is still weird. What I like least about it, at least from a basketball perspective, is that Fisher missed a Knicks practice because he couldn’t get out of L.A. When you are Gregg Popovich, you can do that. When you are Derek Fisher, you cannot. 1. Oh, and subscribe to the podcast on iTunes here.